In October last year Chris Fletcher drew my attention to an early Chinese missionary printing block advertised for sale in a catalogue of mostly western books which I would not normally have seen, and I bought it immediately. It is now in the Library, shelfmarked Sinica 6002. The bookseller was Samuel Gedge (Hanworth, Norwich), and his Catalogue XIV says that “the Chinese text, identical on both sides, includes a translation of the Lord’s Prayer in the version of the missionary Robert Morrison (1782-1834).” (no.59, p.46). The columns of the Lord’s Prayer are widely spaced. The two punctuation marks 、 here are only found on side B. This circle divides the first four commandments (concerning God) from the last six (concerning others). So far, I haven’t found the text of either the Lord’s Prayer or the Ten Commandments exactly as it appears on this block in any of Robert Morrison’s works. But it comes very close, and certainly much closer than the text of any other versions. Similarly, I have compared the text of the Ten Commandments with the versions in Exodus 20:1-17 and Deuteronomy 5:4-21 of Morrison’s Old Testament (completed in 1823 with the assistance of William Milne), and it comes very close to the text of the Exodus account. As ever in this game, each additional piece of information raises more questions than it answers: where are the other blocks, and who is Bennet? But first, I must acknowledge the help of my former colleague Ralf Kramer in solving the problem of “Waltefreden” (which at first I had found impossible to read). It is actually an anglicisation of Weltevreden, a wooded, swampy place 12km southeast of the old city of Batavia (now part of modern Jakarta, the capital of Indonesia). As its name suggests, the European colonists found Weltevreden to be a more pleasant place to live than the old walled city of Batavia, which was dirty and overcrowded and suffered from bad sanitation. According to an article in The Jakarta Post (Saturday 19 February 2000), in 1797 the Dutch colonial authorities started to turn it into an administrative and military area. Soon after, Herman Willem Daendels, governor-general of the Dutch East Indies from 1807 to 1811, selected the site for his residence and also for the new city centre. Also, the blogger P’i-kou has pointed out that it was in his residence at Weltevreden that Daendels established the first printing press in Batavia, around 1810. Medhurst’s mission and its press however were based not in the governor’s residence, but in Parapattan, so that the reference on the block is to the general area in which Parapattan was located, not the governor’s press. Turning to the block itself, there is something odd about it. I’ve already noted that the text is almost absolutely identical on both sides, but also, neither side has ever been inked – the block has never been used to make an impression. The format is also puzzling. The text appears in a frame, as if intended to be a leaf of a book rather than a “sheet” tract. But neither the title nor collation details appear where they would normally be in the central column of the block, which is completely blank. 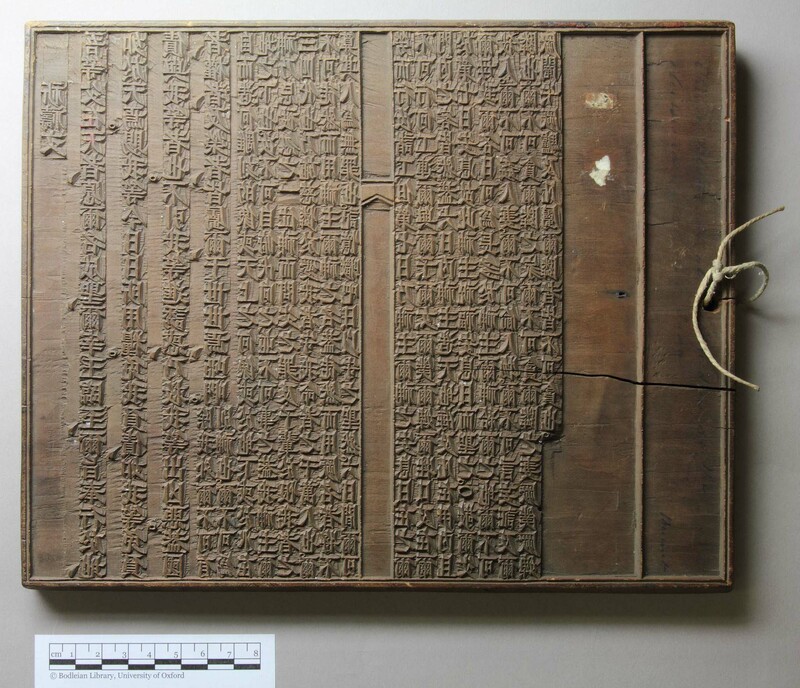 I wonder if the block was produced as a specimen, to show what a Chinese block looked like, and how leaves were printed and bound to make books? And perhaps more than one of these specimens was produced. It is hard, but essential, not to be led astray by wishful thinking. 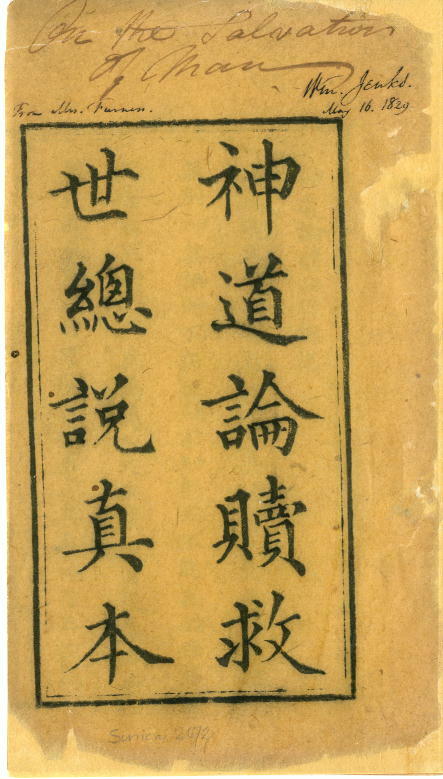 This is why I hedged my bets with dating our copy of the earliest Chinese tract (also by Morrison) in my previous blog entry. But there’s nothing wrong with putting something up for others to shoot down – this is surely partly what a blog is for. As indicated in the inscription, the missionary station in Java was in Batavia, and Walter Henry Medhurst was in charge of it. Medhurst was born in 1796, and at the age of 14 was apprenticed to a printer. In this capacity he replied to an advert by the London Missionary Society for a printer to join their mission at Malacca (now Melaka on the southern coast of the Malaysian peninsula, half-way between Kuala Lumpur and Singapore). He was accepted, and on the way there “entered into a matrimonial alliance” as Wylie deliciously puts it (Memorials, 25) – fast work, which surely lays to rest any notion that the missionaries might be boring! He reached Malacca in 1817, and was ordained there in 1819. Having spent a year in Penang in 1820, he moved to Batavia for the next eight years. There, as in Malacca, a major part of his work was in setting up a printing office. In Journal of voyages and travels by the Rev. Daniel Tyerman and George Bennet, esq. Deputed from the London Missionary Society, to visit their various stations in the South Sea islands, China, India, &c., between the years 1821 and 1829 (London, 1831), the entry for 22 August 1825 (vol.2, 223-224) gives a detailed description of the process of blockprinting, which was observed in “Mr Medhurst’s office”. I wonder if our block was produced for Bennet to show to the London Missionary Society when he got home? 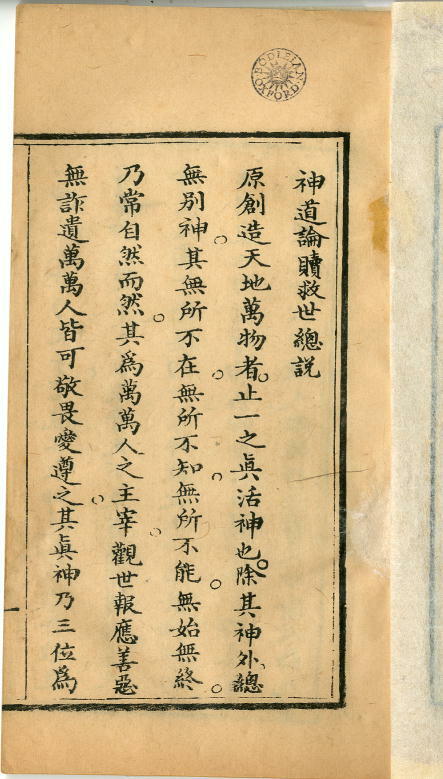 As indicated in my last blog entry, we have a very fine collection of Protestant missionary material in Chinese, dating mostly from the first three quarters of the nineteenth century. Our collection consists mostly of tracts, of which we have over 1,300 different editions with many duplicates. Our Chinese Bible collection is not as big as that of the Bible Society, which was transferred to Cambridge University Library when the Society sold its premises in central London and moved to Swindon in 1985. Nevertheless, it is significant, and we have copies of most of the landmark editions. But we lacked a copy of the very first printed edition of Holy Scripture in Chinese, Lassar and Marshman’s gospels of Matthew and Mark printed at Serampore in 1810, and we also lacked a copy of the earliest known tract, which was written and printed by Robert Morrison in Canton in 1811. Remarkably, during my time in the Bodleian I have had the opportunity to acquire copies of both these things, which I will now describe. But I’m not entirely satisfied with my findings so far, particularly with regard to their dating. This is rather disturbing, as both items must be reckoned among the most valuable in our Chinese missionary collection, and would certainly take pride of place in any exhibition of this material. 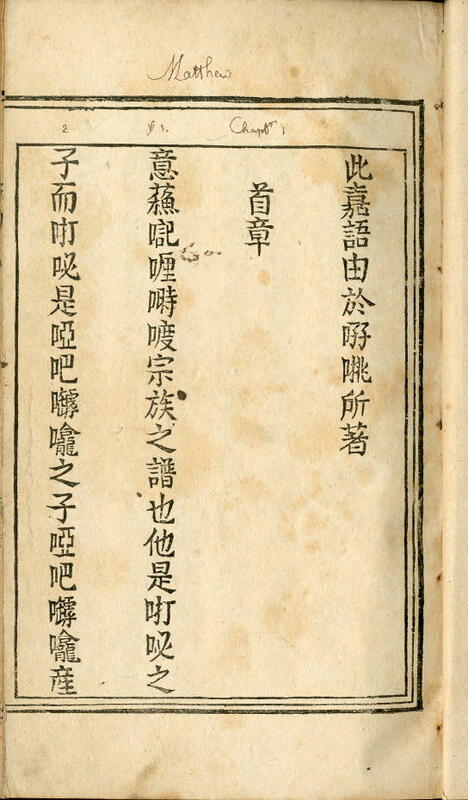 William Milne’s Restrospect of the first ten years of the Protestant Mission to China (Malacca, 1820, and digitised by the Staatsbibliothek zu Berlin among others) contains a List of books written and printed by the members of the Ultra-Ganges missions (pp.267-287). 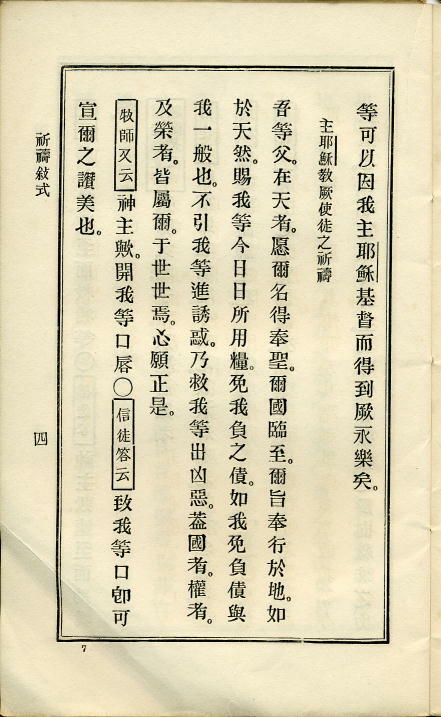 Although this is an invaluable guide to the earliest Protestant publications in Chinese, and is in some respects very detailed (for example in giving the number of copies printed), it doesn’t say where the editions were printed, nor does it seem to be complete; it makes no mention for example of Lassar and Marshman’s gospels and Bible described below, and it omits at least one of Morrison’s tracts. I’m inclined to think that most of the dates mentioned refer to printings, and not editions, as it is scarcely credible that new blocks were cut for printing as few as 20 copies (in 1816). I think we are dealing with two sets of blocks only: the first cut in 1811, and the second in 1815, after the printing of 10,000 copies in 1814 had worn out the earlier blocks. In the absence of an imprint, how are we to know the date of our copy? If Milne’s account is accurate, we should at least be able to identify it on the basis of size. 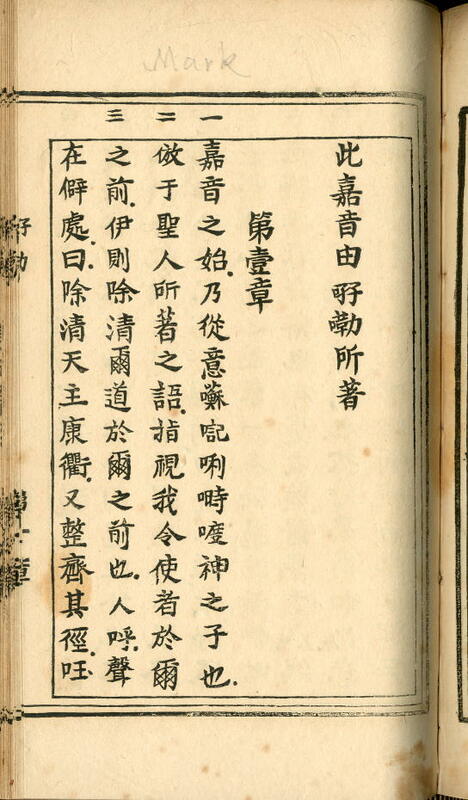 But the terms “octavo” and “duodecimo” of course are not strictly applicable to Chinese books, and even in the west, are not as precise as the measurements in centimetres which we now use, as they are terms which relate to the size of a single large sheet, itself subject to variation. Most likely, Milne was simply pointing out that the later edition was smaller than the earlier one. Unfortunately, the size of our copy is what I would describe as “middling” for a tract of this kind – many are bigger, many are smaller. 24/25cm. 4 leaves. 7行20字. (Harvard, Australia, Glasgow). 19cm. 6 leaves. 5行20字. (Harvard, Bavaria, Leiden, Oxford). I have photocopies of both the Harvard copies, and the Australian copy has been digitised. The larger Harvard copy is from the same blocks as the Australian copy, and the smaller one is from the same blocks as ours, supporting my belief that only two editions were made. The question is, which is which? Were the blocks recut in smaller format, so that 6 leaves were required rather than 4, or in bigger format, so that only 4 leaves were required rather than 6? Milne’s information cannot be correct, as he lists the larger octavo edition as having 6 leaves – it is the reverse of what the surviving copies suggest. And the picture is further confused by the number of copies printed – over 10,000 in the case of the earlier edition, but fewer than 2,000 in the case of the later one. Wylie (Memorials, 4) lists only one edition (“6 leaves, Canton, 1811”), which does not get us any further forward. I have therefore hedged my bets in the catalogue by giving the date of our edition as 「1810年代」- “the 1810s”. This is more straightforward to explain: we have the gospels of Matthew and Mark translated by Joshua Marshman and his teacher, the Chinese-born Armenian Joannes Lassar. The two parts were originally printed separately (from blocks), but are printed together in the Bodleian copy. There are two copies of St Mark only in Regent’s Park College. Not only is the calligraphic style of the printing rather odd, but so is the terminology used by the translators, who invented many characters to transcribe the sounds of proper names in the text, including the names of Matthew and Mark, as indicated above. In the largest character dictionary that I know of, (中华字海, first published in 1994 and containing 85,568 characters), the first character in both names (𠲚) is given the pronunciation yi, but here it may have been independently created by Lassar and Marshman from 口 and 孖, which is pronounced ma in both Mandarin and Cantonese. The character 嘞 is pronounced lei in Mandarin, and laak in Cantonese. Marshman arrived in Serampore in October 1799, and began his study of Chinese in 1805, under Lassar. As he never set foot in China, the distinction of being the founder of the Protestant mission to China goes to Robert Morrison, who began his study of Chinese in London in 1806, and arrived in Canton in September 1807. He produced a translation of Acts which was printed from blocks in 1810, but slightly later than Lassar & Marshman’s gospels. The Bible Society collection has copies not only of all these things, but also of several more partial translations by Marshman and Morrison in this initial period of activity. 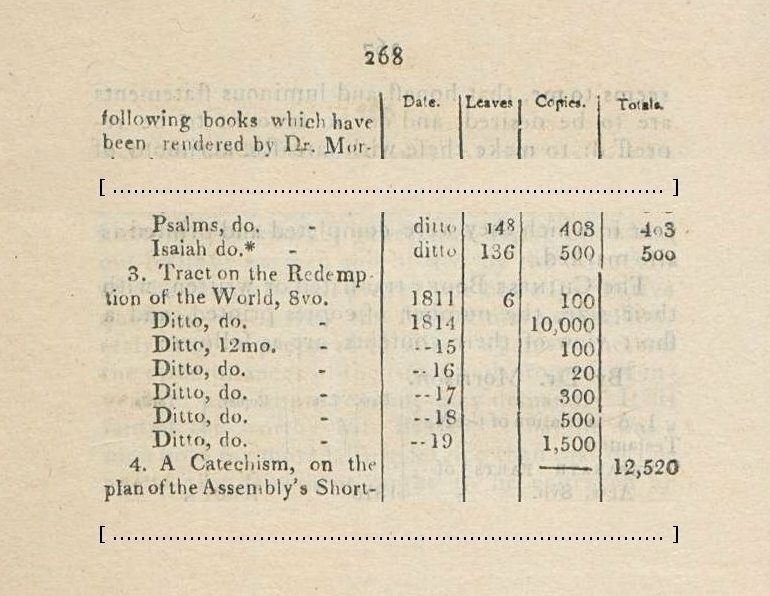 The first complete New Testament was produced by Robert Morrison and published at Canton in 1813 (Sinica 101), quickly followed by a second edition in smaller format in 1815 (N.T.Chin.e.1, Sinica 1296, and three later printings from the same blocks). The first complete Bible was Lassar and Marshman’s version published serially in Serampore, starting with the Pentateuch in 1817, the whole Bible being completed in 1822 with the publication in that year of the New Testament and the Old Testament books Joshua-Esther; the Library has two impressions of the complete work (Bib.Chin.d.1 and Bib.Chin.d.8). I bought our copy of Lassar & Marshman’s Matthew and Mark from Han-Shan Tang (London) in 2004. They had acquired it from Bristol Baptist College. Actually, that organisation was only ten minutes’ walk from the school I attended between 1961 and 1968. How strange that then, as now, I should be living in such close proximity to this book!